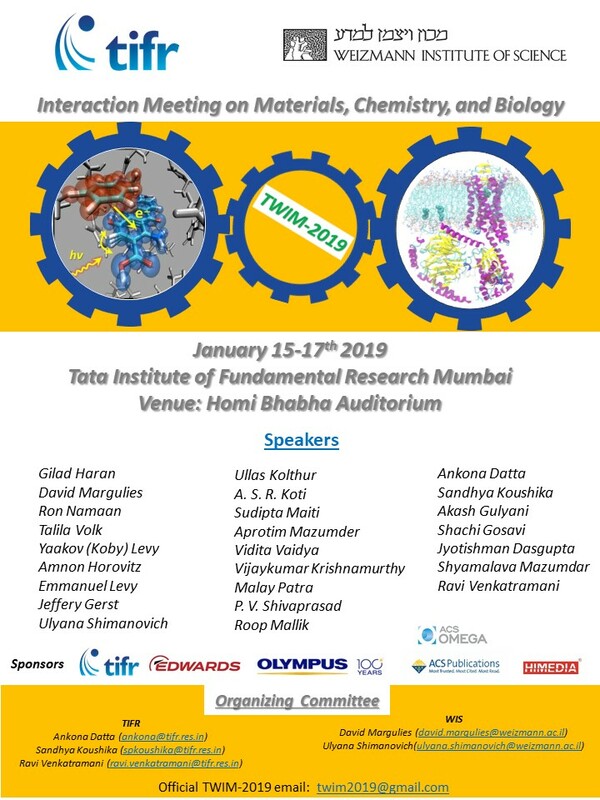 The Department of Chemical Sciences and the Department of Biological Sciences will be jointly hosting the TIFR-Weizmann Institute of Science Interaction Meeting (TWIM-2019) during January 15th to 17th 2019 in the Homi Bhabha Auditorium at Tata Institute of Fundamental Research, Mumbai, India. TWIM meetings were initiated in the year 2006 to foster interactions between scientists from Tata Institute of Fundamental Research (TIFR) and the Weizmann Institute of Science (WIS). Since then there have been a total of five editions of the biennial meeting held alternately in TIFR Mumbai and in WIS, Israel. The meetings have typically included around a dozen faculty members and similar number of students from the visiting institute. Due to its small size, the meeting provides an opportunity for scientists from both sides to have extensive discussions on their research questions and results. The themes of past meetings have spanned many areas of physics, chemistry, computer science, and biology, with the focus becoming more specific in the latter editions. TWIM-2019 will showcase research in chemistry, biology and interfacial areas. Please click here for the full program schedule.